Gastroschisis and omphalocele are the most common congenital abdominal wall defects. Very commonly encountered associated chromosomal abnormalities and structural malformations significantly modify treatment strategies in the patients with omphalocele, while congenital cardiac defects are currently observed more frequently in gastroschisis than previously recognized. The incidence of gastroschisis is continuously increasing in the Western world. 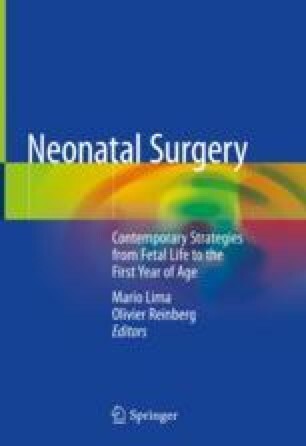 Despite recent developments of novel abdominal closure methods, including sutureless-staged closure with preformed silo in gastroschisis, and primary skin graft followed by expansion of the abdominal cavity and delayed abdominal wall closure with compartment separation in omphalocele, both conditions are still associated with significant morbidity. Dysmotile intestine in gastroschisis, especially when complicated by intestinal atresia, perforation, or necrosis, predisposes to prolonged dependence of parenteral nutrition and complications of intestinal failure. Mortality in omphalocele is mainly caused by associated congenital malformations and lung hypoplasia occasionally observed with a giant defect. With carefully planned, individualized multidisciplinary management, well over 90% of gastroschisis patients currently survive, while mortality in omphalocele remains higher mainly due to associated disorders. Mikko Pakarinen was supported with research grants by the Finnish Pediatric Research Foundation and the Sigrid Juselius Foundation. Danzer E, Gerdes M, D’Agostino JA, Bernbaum J, Hoffman C, Rintoul NE, et al. Patient characteristics are important determinants of neurodevelopmental outcome during infancy in giant omphalocele. Early Hum Dev. 2015;91:187–93. https://doi.org/10.1016/j.earlhumdev.2014.12.009.